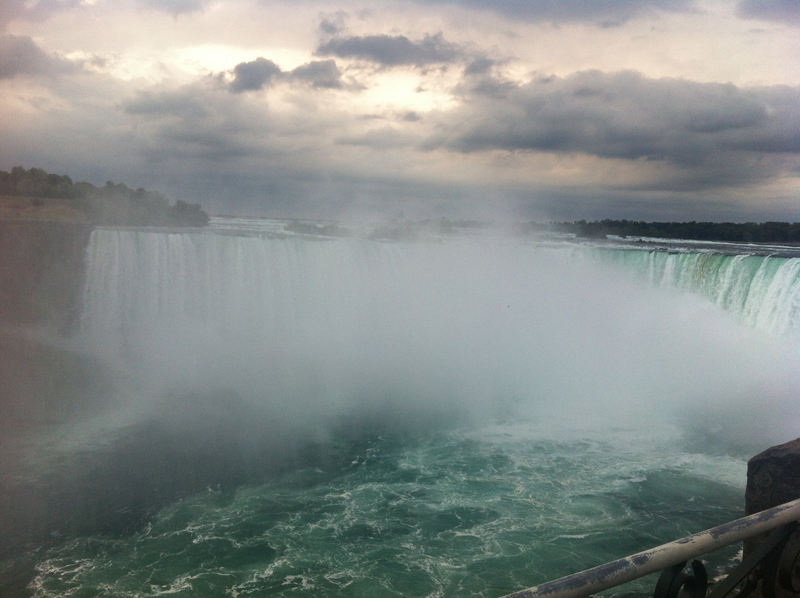 The day started out with a tremendous view of the falls and some welcomes misting on what was a muggy day. The first 50 miles were the toughest riding thus far due to a 30MPH south-north wind. I’m riding dead west so this makes stability a but of a chore. Quick stop for fuel, check the oil and I’m back out. Around 11AM it started to rain. This was a great chance to stop and actually grab some breakfast. Denny’s – perfect! Apparently a pretty popular place and the food was surprisingly good. I think I’m reconsidering client entertainment. I finished breakfast and talked myself out of buying a Canadian soccer jersey At the rest stop (it seemed like a good bit of irony as TSN (the Canadian ESPN) wouldn’t stop bragging about their first gold – women’s trampoline – yes, I am judging). By the time I was ready to leave the rain had intensified. Full rain gear it is. The look is stupid but I only brought 2 pairs of jeans and want to avoid getting either pair soaked (too much info, yeah- I get it). Eventually it cleared up and I hit the border bridge to enter the US at Detroit. The bridge was backed up and the temp was up to 90+ so the bike was getting a little pissed at me. I skipped traffic, rode to the top of the bridge and shut of the bike coasting to the checkpoint. An interesting learning is the more putzy you look, the less scrutiny you get at the border. I was wearing rain-gear and an alien-head helmet. Clearly this is not the profile of an enemy to the state. Back on the road and am one hour from downtown Detroit where I would meet Jim and Sarah at Coney Diner near 8 Mile for lunch. Around 3PM I arrived for lunch. It was so great to see a couple of friendly faces and catch up on their lives. Most interesting was a conversation about spiritual healing – mind over matter was how it was simplified for me. Earmark this page – I’ll research it when I get back. Back on the bike and 230 miles to south bend. Uneventful ride but did get to Southbend around 9. 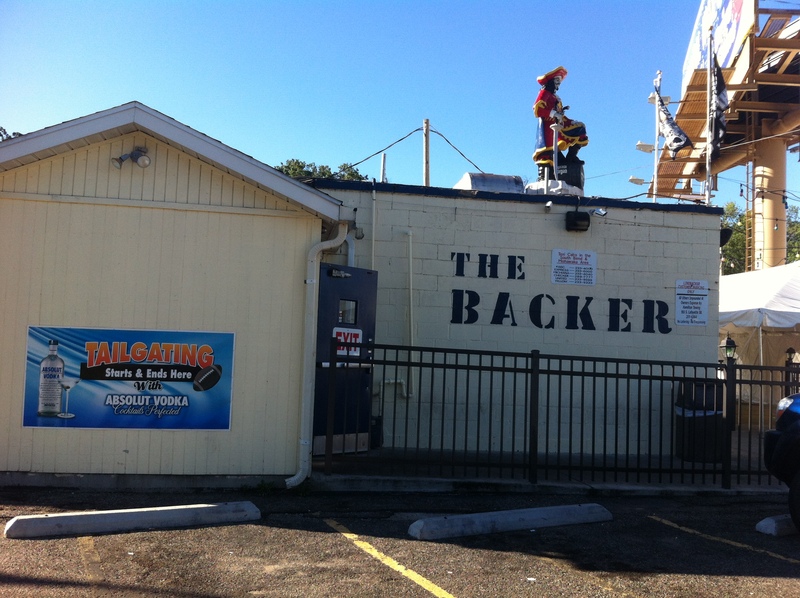 The desk clerk suggested I go to “the linebacker inn” for dinner. It’s a 50ish year old Notre Dame favorite that serves up a pretty good chilli and mean burger. I’m pretty sure that if my bike’s oil level is low tomorrow I can top it off with the droppings from a single burger – good to know. 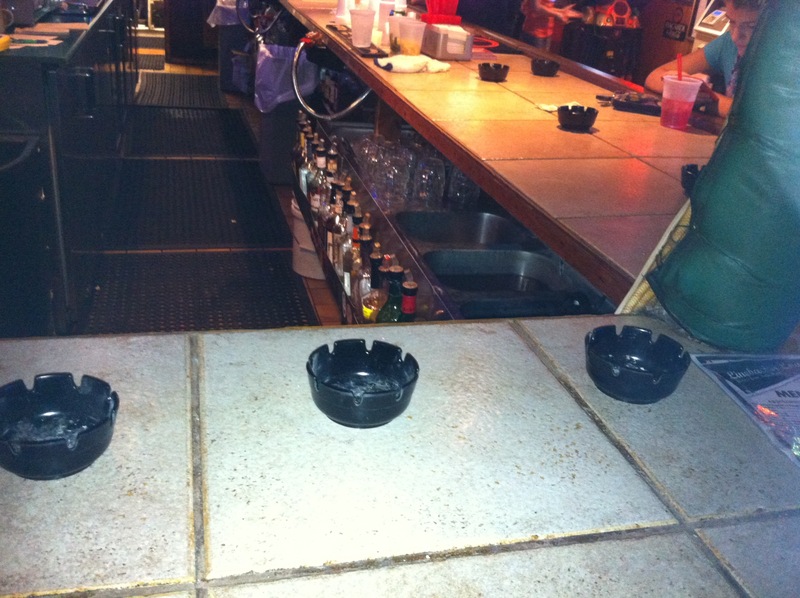 You can smoke in this bar – that’s a nice walk back to yesteryear. Wish I brought a cigar.